Ruby on Rails is an amazing framework for building web applications. The Ruby and Rails ecosystems are very active and mature, with many libraries for solving the various problems encountered by developers. But one particular area where I feel Ruby lacks options is reporting. Many solutions exist in Rails for generating reports, most of them rely on generating HTML and converting to PDF. This approach has its advantages, but falls apart for complex and pixel perfect reports. Enter JasperReports. JasperReports is a very popular open source reporting library widely used in Java world. Many of you may be curious about how to use a Java library in Rails. There are many approaches, but the one I prefer is to use JRuby. This requires you to convert your application to JRuby, which is quite simple to do these days. So, let’s get started. We will create a sample Rails application with a contact model and CRUD actions. The application will use JRuby, Rails 4.2, and SQLite as database to keep things simple. First of all, install JRuby with RVM or rbenv. Point your favorite browser to http://localhost:3000/contacts and make sure everything is working properly. Create some records so we can use those later. Let’s create a simple report that shows list of contacts. Download the JasperSoft Studio suitable to your platform from the Jaspersoft Studio site. Install and run Jaspersoft Studio. 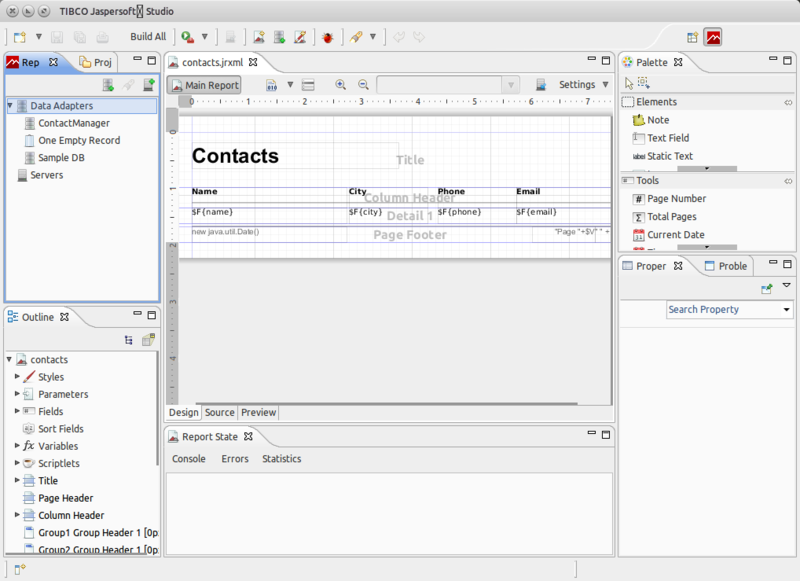 It is full fledged IDE based on Eclipse, specifically to design JasperReports. It has a learning curve, for sure, but we will not get into those details for now. You can refer to Jaspersoft Studio – Resources for more information. 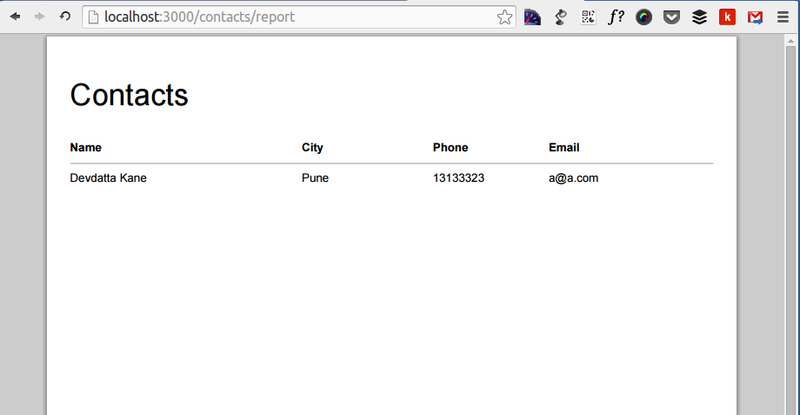 Compile the report and paste the contacts.jasper file into app/reports/ in our Rails application. Now comes the important part, integrating JasperReports into the Rails application. We will be using JasperReports 6.1 version for this tutorial. Head over to the JasperReports Library page and download jasperreports-6.1.0-project.tar.gz. This archive contains the JasperReports JAR files in its dist folder, along with dependencies in lib folder. Copy all the files from both of those folders and put them in a folder named jasperreports under the lib directory in our Rails application. @conn is a JDBC connection from the ActiveRecord connection pool, since JasperReports requires a JDBC connection to execute the query. The first item is a JDBC statement, stmt = @conn.create_statement, which returns a JDBC ResultSet by executing @result = JRResultSetDataSource.new(stmt.execute_query(@query)). The report (.jasper) file created earlier using JasperStudio is set to the report_source. After that, invoke the JasperFillManager.fill_report to fill the report with the provided ResultSet and parameters. Lastly, invoke JasperExportManager.export_report_to_pdf to export the report into a PDF bytestream which is returned using String.from_java_bytes. This helper method simplifies the report invocation and sends the response back to the user. There are also added options for providing a filename, along with a disposition option to open the file within the browser or download it as an attachment. As we have no parameters to pass and want to open the report in browser, we have skipped the download and report_params from the method call. Fire up the server and go to http://localhost:3000/contacts. Click on ‘Download as PDF’. You should now see a PDF file with all contacts listed. This was a quick primer on how to integrate JasperReports with Rails to create reports without much effort. There is much more that can be done with JasperReports and Rails, such as search criteria, complex reports, subreports, etc. But that’s for another tutorial. I hope you enjoyed this post. Your comments and insights are always welcome.